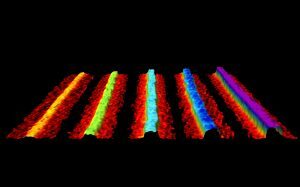 University College London (UCL) scientists have developed the world’s first individual, flexible nanoribbons from crystalline phosphorus. According to the scientists and their colleagues from Bristol, Virginia Commonwealth and EPFL, these nanoribbons could help revolutionize electronics and fast-charging battery technology. The nanoribbons were formed by mixing black phosphorus with lithium ions dissolved in liquid ammonia at -50 degrees C.
After twenty-four hours, the ammonia is removed and replaced with an organic solvent which makes a solution of nanoribbons of mixed sizes. “It’s the first time that individual phosphorene nanoribbons have been made. Exciting properties have been predicted and applications where phosphorene nanoribbons could play a transformative role are very wide-reaching,” says UCL study author, Dr Chris Howard. According to the researchers, these nanoribbons form with a typical height of one atomic layer, widths of 4-50 nm and are up to 75 µm long. The scientists regard this aspect ratio to be akin to that of the cables spanning the Golden Gate Bridge’s two towers. “By using advanced imaging methods, we’ve characterized the ribbons in great detail finding they are extremely flat, crystalline and unusually flexible,” explains first author Mitch Watts. “This has not been seen before and each layer should have distinct electronic properties,” opines Watts. While nanoribbons have been made from several materials such as graphene, the phosphorene nanoribbons produced here have a greater range of widths, heights, lengths and aspect ratios. Moreover, they can be produced at scale in a liquid that could then be used to apply them in volume at low cost for applications. Notable application areas include batteries, solar cells, thermoelectric devices for converting waste heat to electricity, photocatalysis, nanoelectronics and quantum computing.